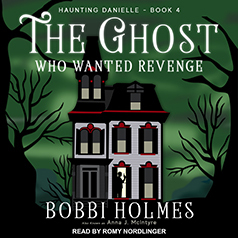 Bobbi Holmes presents the fourth installment in her Haunting Danielle series. With his dying breath, Stoddard Gusarov names his killer: Danielle Boatman. Danielle had a score to settle with Stoddard Gusarov, but murder him? Never. Proving to the police she is innocent is the least of her problems. She has an angry spirit to contend with, the ghost of Stoddard Gusarov—and he's out for revenge.